Using threads of recycled denim, artisan Luisa Villavicencio of Guatemala designs this soft men's sweater. Natural ivory pure cotton thread is mixed with the blue denim to create three stripes of light blue across the chest. Lightweight and comfortable, the pullover sweater has a classic crew neck. 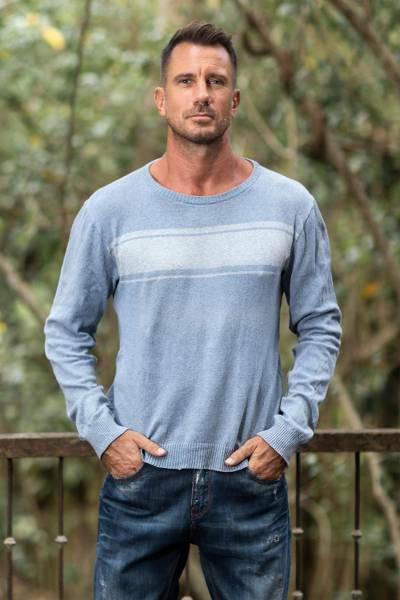 You can find men's cotton sweater 'Sea Blues' by Luisa Villavicencio in clothing categories such as Nat Geo Gifts Sweaters, Eco-Friendly Sweaters, Cotton Sweaters and Pullovers Sweaters. Enjoy exploring these sections for other Novica treasures.